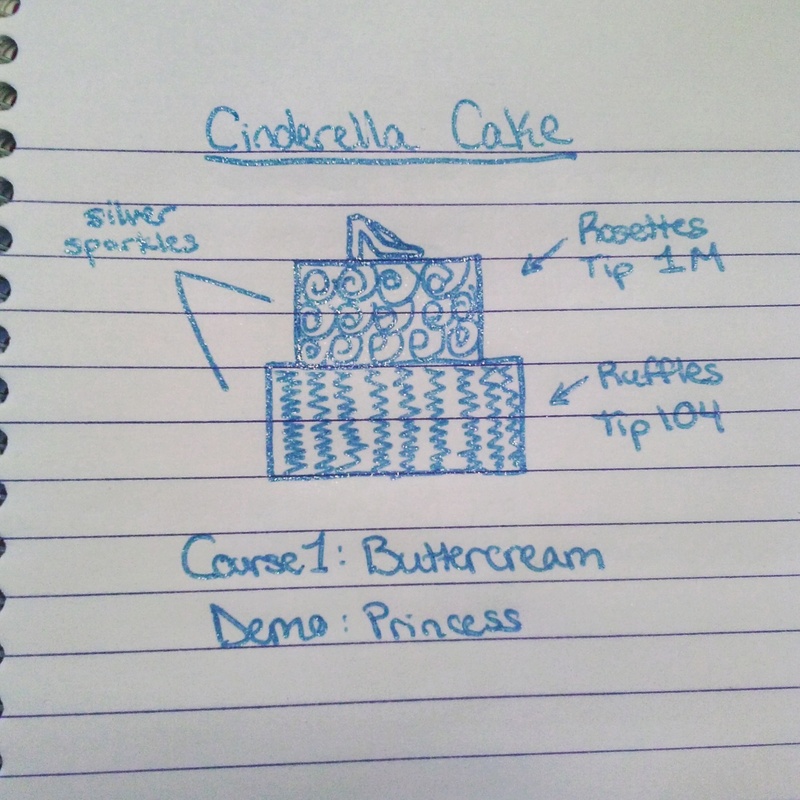 My favorite part about cake decorating is the actual decorating. I do enjoy baking, but sometimes I don't feel like waiting for the oven to preheat, waiting for the cake to bake and then waiting again for it to cool off. With fake cakes I can skip these steps entirely and dive right into the fun part--decorating. Fake cakes, also called foam cakes or dummy cakes, are actually pretty common. Not only are they used in bakery display windows and photo shoots, this cake illusion is used a lot at weddings too. Here's how it works: The "cake" part is actually styrofoam that comes in all different shapes and sizes--and can even be carved. 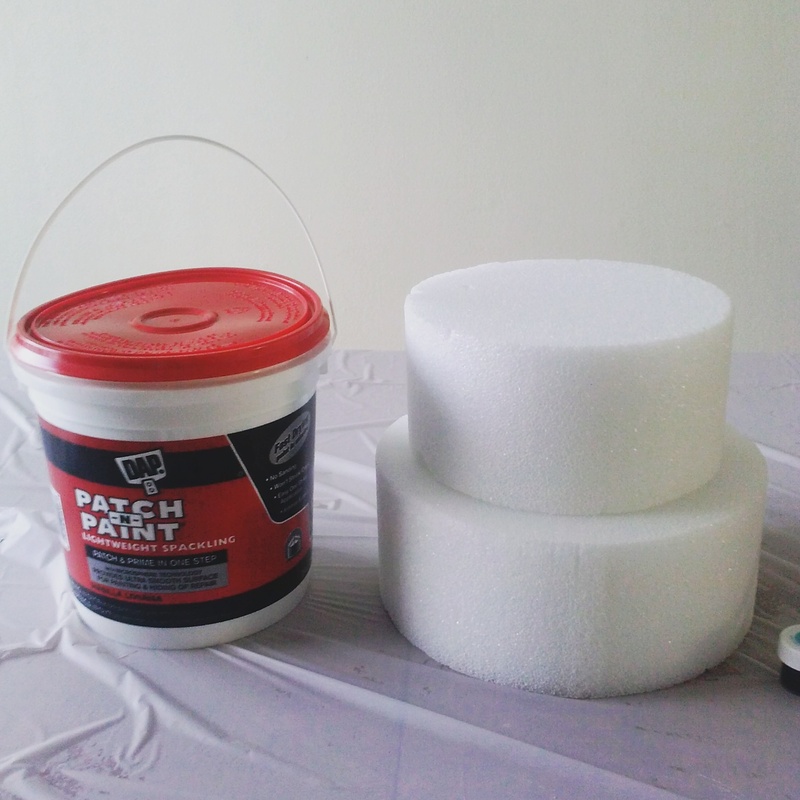 For the frosting, you have few different options; if you want your fake cake to look like a real fondant cake, you can still use fondant over your foam. 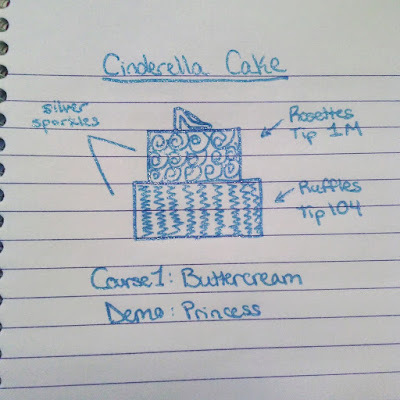 If you want a buttercream look though, you will need to use royal icing , perma ice , or light-weight spackle . Yup, you read that right: you can use spackle from the hardware store for perfect-looking “buttercream." As a Certified Wilton Method Instructor, I needed to make a cake display for my local Michael’s (where I teach) to encourage customers to sign up for my classes. 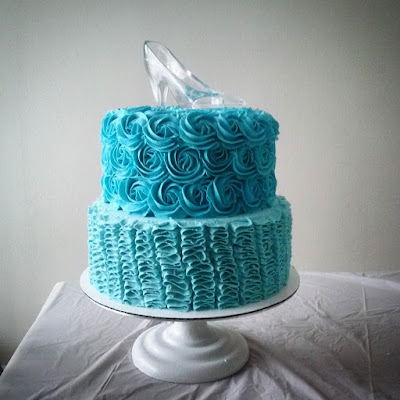 I wanted to make a cake that represents some of the techniques you can learn in Course 1: Buttercream Basics, so I decided to make a two-tier Cinderella cake with ruffles and rosettes. To that end, I needed the following supplies: 2 round Styrofoams (one bigger than the other), light-weight spackle, and a "glass slipper ." The first step was to tint my spackle. I used the Wilton Gel Colors to do this, but I heard acrylic paint works too. Next, I attached the styrofoams together using 4 toothpicks stuck in the bottom of the top tier and pushed it into the top of the bottom tier. 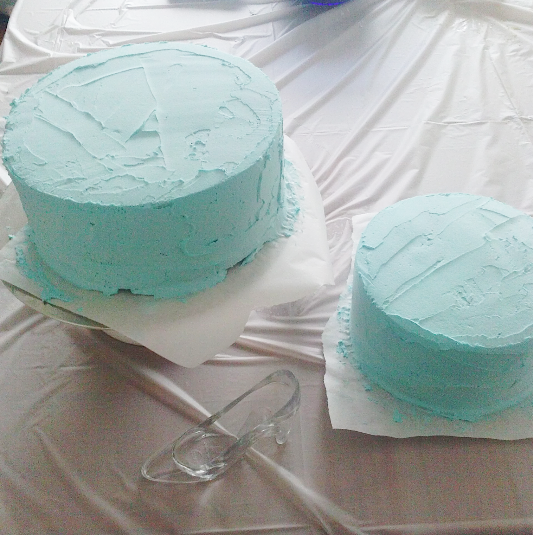 Then, I applied a thin layer of the tinted spackle to my fake cake. Now I was ready to pipe. I started at the bottom tier using tip 104 to make ruffles. Then I moved on to the top tier, using tip 1M to make the rosettes. When I was done, I put it someplace safe to dry. This was so fun and easy to make! The hardest part about making this fake cake, was making sure my kids didn't try to sneak a taste of the "frosting." 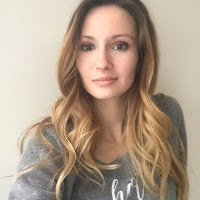 “Opinions expressed are my own and do not express the views or opinions of Wilton Brands LLC”. 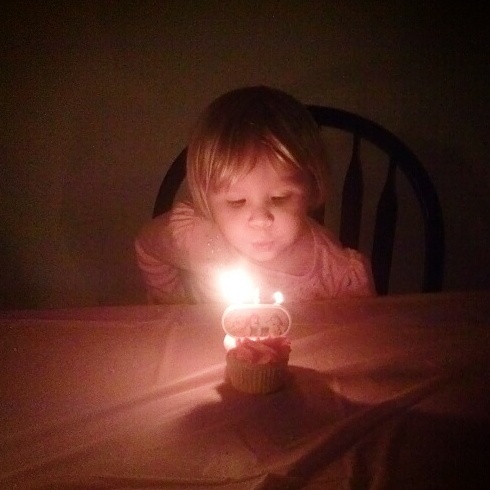 My daughter recently turned 3 and my son will soon be 5. I loved putting together their combined birthday party last year, but I really enjoy making their actual birthdays special and full of fun memories. When it comes to a few of Addison's favorite things, "princess," "cookies," and "cupcakes" are high on that list. So I decided incorporate all three into some whimsical treats she could enjoy. These cookies were so much fun to make. 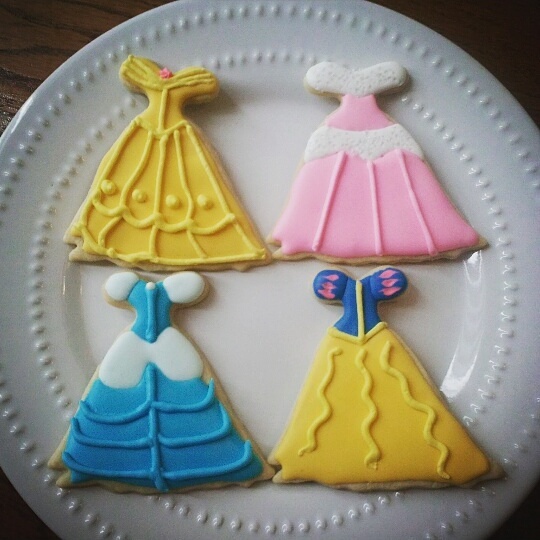 I found this video tutorial for the snow white cookie and used her instructions as a rough outline to make the other princess dress cookies. How clever are these princess cupcakes? 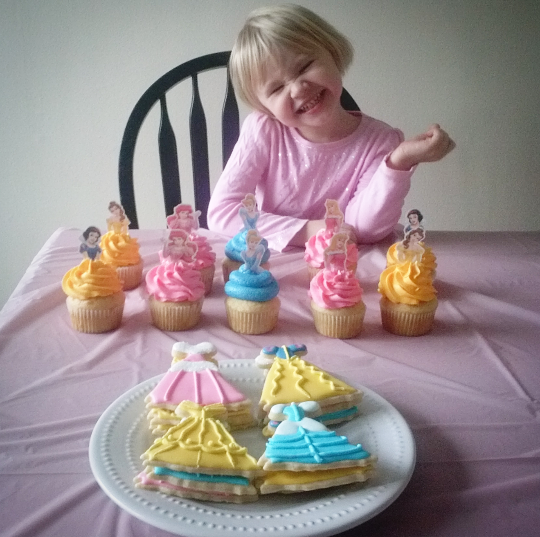 To make this enchanted dessert, I googled my favorite Disney princess images and re-sized them before printing. I then laminated and cut them out before hot gluing each image on to a toothpick. Once dry, I stuck them into the frosting. 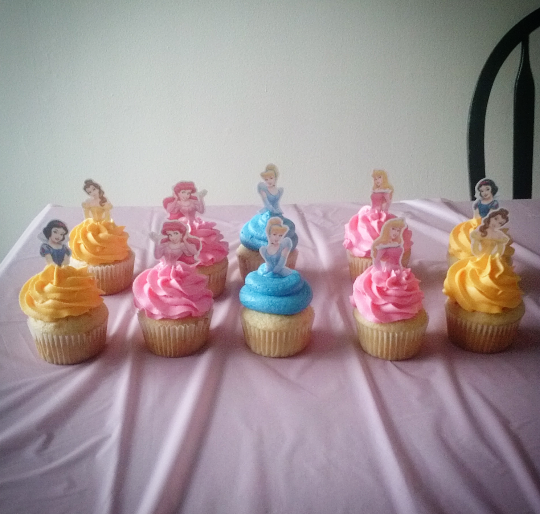 I tried my best to make the frosting color match the color of each princess's dress. We all had so much fun celebrating Addison's birthday, she definitely got the royal treatment.